nine.ch Review 2019: Is nine.ch a Good Hosting? Nine Internet Solutions was founded in Zurich in 1999. Go here for robust, reliable, Swiss could hosting solutions, but be prepared to pay the price. Swiss company Nine Internet Solutions (or simply ‘Nine’) was founded in 1999 and has two ISO certificates (ISO 27001 and ISO 9001) for internet security and quality management. It provides a suite of fully managed solutions to customers worldwide, and its client list includes several notable organizations such as Unicef, World Vision, and WWF. Nine’s sleek but slightly confusing website is available in English and German. You are guaranteed to get your cloud server deployed in less than a minute, with the ability to install any Linux version you want, and with SSH access and root to boot. Also, the “cockpit” custom control panel allows you to manage, control, and back up your cloud server. And you can scale up your disk space for an extra fee. The managed VPS plans are best if you want to concentrate on your business while Nine’s team takes care of the technical stuff. You get web space from 100 GB to 2,700 GB, with 3 GB to 96 GB RAM and unlimited traffic. All managed server packages come with optional features at extra cost, including SSL certificates, DDoS protection from Cloudflare, FTP, MySQL, and Apache. Nine’s robust infrastructure includes three eco-friendly data centers in Zurich, Switzerland, which house more than one thousand servers connected by a route-redundant dark fiber ring to guarantee 99.9% uptime. 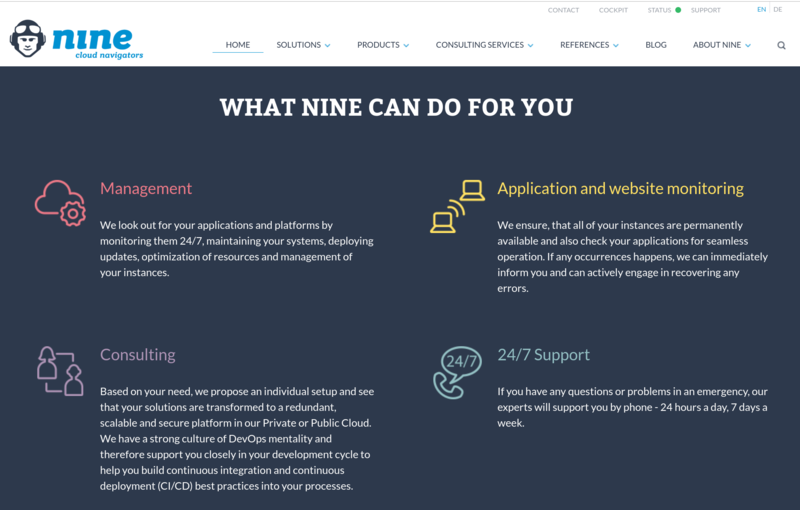 From the information presented on its website, it’s not easy to determine Nine’s standard pricing, but that’s not so unusual for a cloud computing or managed services provider (compared with a self-service shared hosting provider). For each provided service, there are several packages, and there are additional add-ons at extra cost. Factor in the upfront setup fees and Nine’s packages become quite pricey. 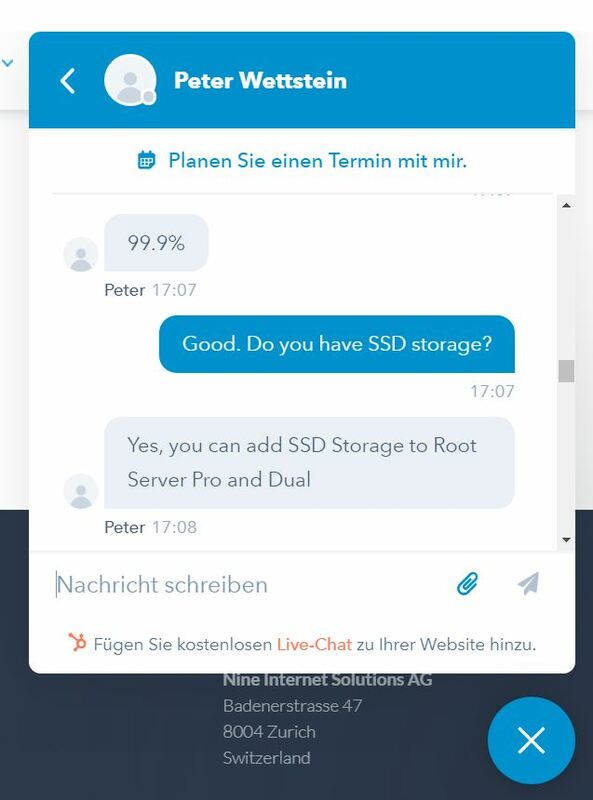 If you’re satisfied with the pricing for this Swiss hosting, you can pay using PayPal, but beware that you don’t get any money-back guarantee. Even though Nine Internet Solutions is one of the most reputable and versatile hosting providers you will find, its offerings don’t stand out. Its non-refundable plans are pretty pricey, and you have to pay extra fees to get more features. Find fully managed cloud hosting at Nine. Wondering how nine.ch stacks up against other Web Hosting companies? Enter any other Web Hosting company and we will give you a side-by-side comparison.